Within the panorama of Dutch genre painting the work of Jan Steen is notable for its satirical tone and the humour that he brought to his lively compositions. Tavern scenes, a wide range of family gatherings in houses or exteriors, cheerful episodes with peasants, children at school and the doctor’s visit to diagnose the results of amorous misadventures are among the many different subjects that he painted. A prolific artist of uneven quality, Steen also produced portraits and historical and religious works of marked originality. The humorous tone of Steen’s painting, which reveals a certain lavishness and excess in the presentation of his themes, led Thoré-Bürger and Schmidt-Degener to compare him to Molière. Steen’s works are cheerful and colourful and are executed with great technical skill. Some of his compositions are apparently anecdotal but conceal a moralising message that illustrates a popular saying. In such cases the artist used inscriptions or particular symbolic elements within the composition that offer the key to establishing the work’s true meaning. On other occasions Steen, who was an outstanding narrator, simply painted a tranquil, agreeable scene with no other intention than that of pleasing. His paintings include a large number of figures whose gazes, poses and gestures create compositions in which spatial and proportional rules are often of secondary importance. The scene is instead unified through an interplay of gestures and of the figures’ facial expressions and bodies, creating groups that interconnect through their shared rhythms. The present panel seems to have been in a private collection in Amsterdam in the first half of the 18th century. It is documented with dealers and collectors in that city until 1833 when it entered the collection of Jan Gijsbert, Baron Verstolk van Soelen in The Hague. Some years later it appeared in London in the collection of Thomas Baring and was inherited by his heirs in 1873, who retained it until the late 1920s. The panel was acquired for the Thyssen-Bornemisza collection in 1929 from the Amsterdam dealer Jacques Goudstikker. Self-Portrait playing a Lute falls within Steen’s most creative period when he lived in Haarlem in the 1660s. At this time his work reveals the influence of Frans Hals, evident here in the choice of the pose as well as the manner of applying touches of paint that enliven the composition. Steen depicts himself with a satisfied air and an ironic expression. He is dressed in an old-fashioned style in a type of clothing worn by actors. Steen also used clothes of this type, inspired by 16th-century Spanish costume, for the figures of lovers in some of his paintings. The composition and setting are simple, as is the colour range with its emphasis on olive green and browns used in a wide range of tones to depict the different types of cloth, wood and tiled floor. Steen also included his self-portrait in some of his genre paintings, for example, the moralizing Easy Come, Easy Go in the Boijmans-Van Beuningen Museum, Rotterdam, and The Happy Trio in a private collection where he again appears in theatrical dress, this time holding a violin. Even in the supposedly formal Self-portrait in the Rijksmuseum, Amsterdam, the frowning Steen depicts himself with restrained irony. 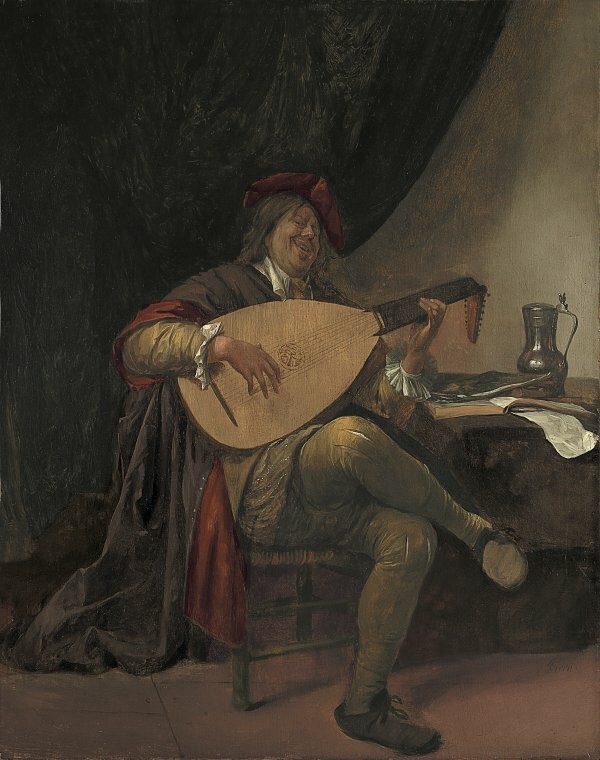 The present Self-Portrait playing a Lute has been related to one of Ripa’s emblems representing the sanguine personality. Following Ripa’s interpretation, the lute, together with the lidded jug and book on the table, are all appropriate to the happy, smiling presentation of the artist in this work, in contrast to the melancholy that is traditionally ascribed to the nature of artists.